Worms are very common in dogs and cats, can cause illness, and in severe cases, even death. The most common intestinal worms are roundworms, hookworms, whipworms and tapeworms. 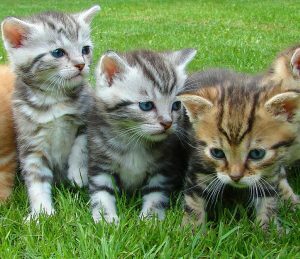 Puppies and kittens require frequent treatment every two weeks until three months of age, then every month until six months of age. Thereafter, the frequency should be determined by your vet on a case by case basis. There are many products you can choose from, including chews, tablets and spot-ons. Our vets can advise on the most appropriate product for your pet. Spread by mosquitoes, heartworm disease is a potentially fatal parasitic worm infection of dogs and less commonly, cats. There are many different products that can be used for heartworm prevention. Our vets will perform a blood test before beginning to use any of these products. This is required to ensure your pet does not currently have heartworm as adverse reactions to preventative treatments can occur. Monthly products, as chewable tablets or spot-on treatments are available. Alternatively, canine heartworm can also be prevented via an annual injection. Heartworm infection in cats is uncommon but often self-limiting and infected cats are managed with supportive therapy.